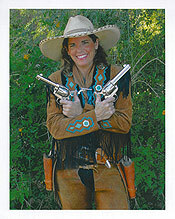 Pistol Packin Paula is the best known Lady Gun Spinner in the world!! For many years she has been asked to share tips about her gun handling that she's now taking her Colt .45's into your home so you can start spinning too!!! Flips: hand to hand, border shift, to the barrel, and over the shoulder. Then put it back into your holster smoothly!!!! Get your copy of a 39 page coloring book about Paula and the gang and see how she saves the day! 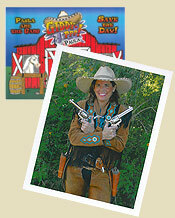 Get your very own autographed picture of Pistol Packin' Paula. Or for just $4.95 more, get it with the coloring book below. Get your copy of a 39 page coloring book along with an autographed picture of Pistol Packin' Paula.